Bordeaux 2009 produced some superb wine. It is not uniformly great, but the praise lavished on it, even before the harvest was complete, is justified on the evidence of the annual Bordeaux tasting held by the Institute of Masters of Wine on 7 November. It offered a marvellous opportunity to taste 106 of the best wines, a year or so after bottling. After a successful flowering and fruit set, a warm, sunny summer produced high sugar levels and with good reserves of ground water, the vines were not stressed. The only real concern was that full phenolic ripeness proved a little stubborn. Fine weather into October rewarded the patient and acid levels did not drop as low as some growers feared. This tasting confirmed earlier impressions that the best wines were made on the left bank, especially in the Médoc. 2009 was a glorious year for Cabernet Sauvignon. The right bank wines can be very good too, but with high alcohol, and a balance in which tannin levels are relatively high and acidity relatively low, the Merlot-based wines sometimes lack the finesse and elegance so evident in Pauillac and Saint Julien. 2009 is also proof that no vintage ‘makes itself’. Some winemakers managed to express the superb quality of the fruit with deft restraint, others seem to have been so dazzled by it that they tried too hard to extract every last drop of flavour from it. High pH also means many wines were open to spoilage by brettanomyces, but only rarely was I aware of this in the finished product. More worryingly, perhaps, although we found few examples of TCA in the samples provided for the tasting, there was often quite a lot of bottle variation. One striking example was Cos d’Estournel. Why this should be so is rather a puzzle. In keeping with the way Bordeaux these days, many of these wines are perfectly approachable now though they will undoubtedly mature well and reveal much more. Here are my notes. They are, perhaps inevitably, a series of snapshots rather than a deeply considered assessment. I didn’t quite manage to taste every wine, but tried to cover as much ground as possible. I’ll follow the traditional order of the MW tasting, but have integrated the first growths into their respective appellations. The wines are generally perfumed, though less than in Margaux. Most show elegance, balanced by a sturdy acidic and tannic structure. Perfumed, though just a little green. Fresh acidity and firm tannins, again just a little green and unripe, a little light, but otherwise elegant. Ripe, perfumed black fruits. Fresh acidity and firm, but ripe tannins. Medium body and concentration. Just a little short. Ripe, perfumed and complex. Medium acidity with rather more tannic, which is a little dry. A long, scented aftertaste. Perfumed black fruits – already quite open. Fresh, elegant, sweet and long. Again perfumed, elegant and complex – especially perfumed in the mouth with fresh acidity and ripe tannins. As perfumed as any in the appellation and more elegant than most, but also spicy, complex and very long. Balanced acid and tannins, but neither stick out. Quite concentrated and ripe with black fruits. Long, but chunky and just a little over-extracted. Even more black and concentrated, with obvious new oak. A powerful wine. Perfumed with more new oak, and a complexity in which Brett plays a part. Very ripe with quite low acidity. Scented black fruits – a little closed. Fresh, juicy acidity, quite firm tannins, a long, perfumed finish. Rather a savoury, meaty aroma. Hefty structure: ripe but chunky. As with the Graves the word ‘perfume’ pops up in most of my notes. It is merited – these wines really do express the typicity of their terroir – as do also those of the other leading appellations of the Médoc. Quality, as so often in Margaux, is not quite a homogenously high as in St Julien or Pauillac. A few wines are a little too extracted, with dry tannins. Quite complex and perfumed, with fresh acids and rather dry tannins. It need time. Sweetly ripe and perfumed, with rather chunky, chewy tannins. Fresh and perfumed, with spicy new oak too. Medium acidity but rather dry tannins, then a nicely perfumed aftertaste. Lighter than most, but perfumed. Open, sweet and quite soft. Very, very perfumed – almost to the point of volatility, but then a lovely balance – fresh, perfumed fruit – the very essence of Margaux – ripe but supremely elegant. Very perfumed and ripe, almost overripe. Quite tight tannins and fresh acidity. A bit short. A model of perfumed elegance married to real concentration. Sweetly ripe and complex with a fine structure and balance. Very long. Relatively lacking in complexity, but fresh and perfumed. Ripe tannins. A bit short. Another wine lacking complexity, but it’s sweetly ripe, with black fruit and a little short. Fresh, but slightly stalky and not too complex. Sweetly ripe and a little short. True to type, the wines are big and structured. Sweetly ripe and relatively simple, with ripe chunky tannis and a good length of ripe, black fruit. The best bottle showed a real concentration of ripe black fruit with a slightly herby perfume. Sweetly ripe, with medium acidity, quite soft but persistent tannins and good length. Tight and a bit closed. Fresh acidity, ripe but earthy tannins. Again, sweetly ripe. Fresh acidity, firm tannins, medium length. Big, ripe and black. Powerful, structured and quite long. Some gloriously fruity, balanced, elegant wines – overall very successful. Very perfumed, ripe fruit. Fresh, beautifully balanced, elegant and very long. Classic Saint-Julien. Quite rich, ripe and perfumed. Fresh acid, rather chunky tannins, but good length. Distinct smell of coffee with spice and chocolate. A little austere, with dry tannins. A bit closed. Bottle variation – the best was perfumed, concentrated, but a bit quite extracted, with dry tannins. Big, ripe and quite forward, with chunky tannins. Fresh, but lacks the style of Léoville Barton. Quite tight, with a lovely perfume, very fresh acidity, firm tannins. Long, elegant, promising, classic. Generously fruity, elegant and perfumed. Perfect balance: fresh acidity and firm, ripe tannins. Immensely elegant, very long. A glorious wine – my favourite in the whole tasting. Big, ripe and concentrate. A bit closed. Balanced with fresh acidity, ripe tannins and an impressive depth of fruit. Lovely, ripe, sweet nose. Fresh acidity, ripe tannins. Very fruity. Not too long, but delicious. A very impressive range of wines. The best show a superb balance between power and finesse. Ripe and fruity. Balanced and fine, it is just a little short. Very perfumed and concentrated with black fruit. Ripe, with firm tannins, fresh acid and yet elegant. Long. Ripely perfumed. Strong but ripe tannins and good length. A big, spicy aroma and black fruit. Initially soft tannins, which then become dry. Rather low acidity and a little over-extracted. Elegant, perfumed black fruits – very Cabernet. Big tannins, fresh acidity, chewy, long and needing time. A big, concentrated aroma of liquorice. Quite chunky tannins, slightly low acidity and just a bit one-dimensional. Fresh, spicy and elegant with black fruit and also a touch of liquorice. Sweetly ripe with quite fresh acidity and firm tannins. Ripe and perfumed. Less complex than some. Sweet, fresh and a little short. Ripe and elegant. A little closed though quite perfumed. Fresh, but with firm tannins. Perfumed and concentrated. Very complex, with new oak showing. On the palate, power, perfume and elegant complexity all combine and it has an exceptionally long, again perfumed finish: a superb wine. Fruity, with black fruits and elegant – quite perfumed. Juicy acidity and slightly dry tannins, but long and fine. Very perfumed and spicy, though also a little stalky. Medium acidity and rather dry tannins. Big, ripe essence of Cabernet Sauvignon, though perhaps lacking a little in complexity. Sweetly ripe, with similarly ripe tannins. A surprisingly light mid-palate. Ripe, sweet and quite elegant, with fresh acidity, firm tannin and good length. Just lacks a little finesse. More perfumed than its neighbour, Pichon-Lalande and very elegant. Fresh acidity and firm tannins. Real depth, complexity and length, but just a hint of Brett? Elegant, perfumed blackcurranty fruits. Fresh acidity and tight, dry tannins: the Cabernet Sauvignon shines through strongly in a wine which normally has a high percentage of Merlot. The most opulent Médoc in the tasting – very rich and ripe, complex and yet a little closed. Good, but not raised acidy, plenty of ripe acids – in fact a super balance and then tremendous length. There are undoubtedly some very fine wines here, but quality is a little variable, with one or two noticeable disappointments. Excess alcohol and over-extraction are to blame. Big, ripe and chunky. Sweet fruit, strong dry tannins. A good wine, but overshadowed by the other first growths. Concentrated and perfumed with new oak. Fresh acids in the context of the appellation with sweet ripe tannins. Elegant and fine. Big, sweet and ripe. Moderate tannins and acidity. Quite concentrated, perhaps just a little over-extracted. Big, sweet and ripe – caramel rich, with moderate acidity, silky ripe tannins and high alcohol. Elagant and ripe, if a little pruney. Medium acidity and soft, very ripe tannins. A fine, long, elegant finish. Very ripe and concentrated, with plummy fruit, moderate acidity, very firm tannins. A rich, powerful wine spoilt slightly by rather a dry, over-extracted finish. Ripe, sweet and complex and pruney – a truly exciting nose. Sweet and balanced, with far better balanced acidity than most in the appellation to support the firm tannins. Very good indeed. Very sweet, ripe aromas of red fruits. Again moderate acidity and strong tannis. A little austere and iron-like at the end. Complex and perfumed. A big, ripe wine that follows the pattern of moderate acidity and stronger tannins. Long and chewy. Ripe, elegant and perfumed. Quite fresh acidity and firm tannins. Long and fine. A powerful bunch. The best manage to cling to elegance and seem to make the most of Cabernet Franc to add freshness. Big, ripe and sweet. Quite fresh acidity, supple tannins. Just a little short. Big, ripe, almost raisiny and concentrated. Good acidity but strong, rather extracted tannins. Big, powerful and ripe. Sweet and rich, with moderate acidity and very ripe tannins. A slightly earthy finish. Ripe, with pruney, raspberry fruit. Quite fresh acidity, strong, dry tannins. Plenty of red fruit favours and quite long. The fresh raspberry scent of Cabernet Franc is evident in quite a rich wine, with balanced tannins and acidity – neither excessive. Not too long. Big, savoury, meaty aromas with chocolate. Moderate acidity, strong tannins. Rich, powerful and quite long. Perfumed, almost herby and minty – a bit a surprise, but lovely balance, it shows both freshness and elegance. Long too. Sweetly ripe and a little pruney. Ripe with a good balance between tannin and acidity. Quite concentrated and long. A little lighter colour than I’d expected. A ripe, rather savoury nose. Balanced, with a slightly earthy finish. Ripe and pruney with sweet fruit, and quite soft tannins. Medium length. Deep, slightly stalky and earthy. Big and rich, with quite chunky tannins. Quite perfumed and fresh, with underlying pruney, very ripe fruit. Rich and very ripe. Moderate acids and tannins. Despite the fact that 2009 is reputed to be a year with high levels of botrytis, the wines, though sweet and opulent, show good freshness and often a rather more bitter, almost phenolic finish than I might have expected. They are very concentrated and powerful. Very ripe, peachy and complex. Concentrated, powerful, almost spicy. A touch of bitterness. New oak shows, but also very ripe, sweet, peachy fruit. Quite fresh acidity. Again a touch of bitterness. Ripe pineapple aromas and flavours. Quite fresh acidity; very sweet, with a soft finish. Lighter and more citrus – lemony. Sweet, but fresh. Another wine with a slightly bitter finish. Ripe, with intense apricot and peach fruit, quite fresh acidity and an almost herby perfume in the mouth. Bitter finish. Rather closed, with confit lemon aromas. Fresh acidity, a little less sweet than some, but alcohol also shows a little. Ripe, peachy and concentrated. Sweetness balanced by lemony acidity. It has quite a bitter finish. Very concentrated but also very fine, with an intense marmalade quality of fruit. The sweetness is balanced by quite fresh acidity. Quite elegant and relatively light with peachy fruit, lemony citrus acidity and a little bitterness. Very concentrated, with intense apricot and orange marmalade fruit. Very sweet – fully botrytised, with a bitter twist. An intriguing nose of apricot with ripe green plums. Very sweet, a touch bitter. Rich, botrytised apricot fruit. Concentrated and sweet, with a little less acidity than many. Hard on the heels of my previous post came news of another extreme weather event that has dashed hopes of a better harvest in 2013 for many growers in the Côte de Beaune. According to Libération, morale is at zeo, with losses in some parts, especially Pommard and Volnay, up to 90% as a result of a violent storm with hail and high winds that struck yesterday afternoon. It is an all too cruel event for growers who lost so much in 2012. Is the culprit climate change? It seems likely – and is very worrying. I visited a handful of my favourite growers last week and looked in one or two producers new to me. It was a brief trip, but gave a valuable insight into recent vintages, especially 2011, which is shaping up to being an extremely attractive wine for relatively early drinking. I also learnt more about the problems created by an ever more unpredictable climate and a succession of worryingly small harvests. Domaine Debray is a small merchant house, based in Beaune. It was founded by wine merchant Yvonnick Debray in 2006. In addition to grapes bought in from a wide range of appellations in the Côte d’Or and Mercurey, Debray owns a few hectares of his own vineyards, notably in the Hautes Côtes de Beaune, near Le Rochepot. This was my first visit to their cellars. We tasted a number of 2102s from the cask. Winemaker Jean-Philippe Terreau looks to make supple, fruity red wines and fresh whites. For the white wines, whole bunches are pressed directly and after 48 hours settling, are fermented with indigenous yeasts and aged in casks with little or no lees stirring. The red wine grapes are de-stemmed, cold-soaked for several days and then fermented with indigenous yeasts. Extraction is managed mainly by pumping over with a little pumping down towards the end of the fermentation. Hautes Côtes de Beaune Blanc 2012 shows fresh acids, with fine sweet, white peach fruit, with a slightly floral aroma. Pernand-Vergelesses Blanc 2012 is more toasty, citrus, mineral and complex, with a good persistence of fruit. Saint-Aubin Blanc 2012 is particularly good, with a creamy texture, despite the house style of little batonnage, and again, fine, precise lemony fruit, with a mineral finish. Corton Charlemagne 2012 seeks to impress with richness and considerable complexity, but shows quite soft acids. I prefer the more racy style of the Saint-Aubin. Of the 2102 reds, a Santenay Premier Cru, Clos Rousseau is delicious, rich and spicy, with vivid cherry fruit and balanced acids. It was aged in 30% new oak. Nuits-Saint-George shows the typicity of the appellation with tight black fruit and quite chewy tannins. Pommard Premier Cru Les Chaponnières, in a sample drawn from a new oak cask, is again true to its origin, with fresh acidity, firm tannins and rich fruit. Clos de Vougeot, again from a new oak cask, is floral and fine, with rich black fruit aromas, fresh acidity and a silky texture. Although both the Clos de Vougeot and the Corton Charlemagne are undoubtedly good wines, I feel that the estate’s most successful and elegant wines were at village level. The 2011 St Aubin confirms this, with good focus, freshness, linear, citrus fruit and a mineral twist. 70% of the wines are exported (Private Cellar in the UK). They are certainly worth looking out for. I am always impressed by the wines of the Domaine Taupenot-Merme at Morey-Saint-Denis. Romain Taupenot, surely one of the best winemakers in Burgundy today, is as modest as he is gifted. In 2012 he lost up to 80% of his crop in the Côte de Beaune, with two severe hail storms, powdery and downy mildew, sun-scorched berries, and in Saint-Romain a sounder of fifty wild boar, which devoured three and half tonnes of white grapes in two days. The flowering in 2013 gives much more hope of a good crop, though there is, Romain says, some coulure on early plots in the Côte de Beaune. 2013 certainly looks like being a much later harvest than in recent years – it does not look likely to begin until October. Romain’s viticulture in organic, though not certified so, and his winemaking is determinedly low-interventionist. Pinot Noir is usually fully de-stemmed. He believes that unless the stalks are exceptionally ripe (as, for example, in 2005) they should not be included. A long cold soak leads into fermentation with indigenous yeasts unaided by any enzyme. Gentle punching down at the start of extraction is followed mostly by pumping over. Romain avoids punching down in years such as 2007 and 2011 if there is a danger of extracting unripe tannins from the pips. “I enjoy vanilla, but in a dessert, not in my wines”, he quips and therefore uses no more than 40% new oak for Grands Cru wines, 30% for Premier Cru and 25% for village wines. Romain believes that the elegant 2011s will come to resemble the 2007s, with their slightly floral perfume, but he also thinks that they show more concentration and a slightly fresher acidic structure. He felt it necessary to chaptalize most cuvées to about 0.5% abv. The extra sugar helped, he said, to prolong the fermentation. Saint Romain (rouge) 2011 shows fine, bright cherry fruit with a touch of earthiness and a slightly floral aroma. The balance is perfectly judged – with fresh fruit and a mineral end. For Romain, balance is essence of fine wine. Gevrey-Chambertin 2011 shows typical black fruit aromas, again quite floral and has a fine depth of flavour, with great purity of fruit and real length. Again the balance is exquisite. Morey-Saint-Denis Premier Cru, Les Riottes, 2009 made from the fruit of fifty four year-old vines is a superb wine, with a wonderfully complex aroma of wild cherries dusted with mixed spice. It is rich, with silky tannins, but as so often with the wine of this estate, a fine, linear structure and perfect balance. The acidity, so often lacking in this ripe vintage, is fresh. Mazoyères-Chambertin 2007 is drinking splendidly. A rich nose of cherries in alcohol leads to a concentrated palate of red fruits with hints of darker fruit below. It almost goes without saying that it is perfectly balanced and is a fine example of just how good this underrated vintage can be. Saint Romain Blanc 2011 is very good. It has genuine finesse, with aromas of honeysuckle, white peach, fresh acidity and underlying minerality. The crisp acidity shown in Romain’s 2011s is not always as defined clearly in the wines of other estates. Jean Fournier is a grower with a reputation for bringing the very best out of his vineyards, mostly in Marsannay, farmed organically. This was my first visit. He is not afraid of doing things just a little differently. He includes around 25% whole bunches for red wines and after a cold maceration of up to ten days a maceration which, according to the conditions of each harvest, normally includes two punch downs and pumpings over each day. Unusually, in Burgundy he also carries an occasional rack and return, which he says, helps to counter any reductive tendencies in the wine, something which he says is a tendency of musts from organically-grown grapes. He favours 600 and 350 litre demi-muids to mature his wines, which impart less oak extract. Despite the use of rack and return, his red wines showed no sign of over-extraction, just fresh, crunchy fruit. The entry-level Marsannay Cuvée St Urbain 2011 is a great success, with a concentrated aroma of spicy black cherry, good concentration and fine-grained tannins. Marsannay Longeroies 2011 has tight black fruit, firm tannins and has good length. Marsannay Clos du Roi 2011, from a site also with a high limestone content, just to the north and the border into the commune of Chenôve is big and rich with an even fresher expression of black cherry fruit, rounded tannins and a distinct minerality. Gevrey-Chambertin Clos Prieur 2011 (from the part of the site in village appellation rather than premier cru) is richer still, with very fresh acids to balance the concentrated, crunchy fruit. Another speciality of Marsannay is, of course, rosé. Fournier’s 2012 is exceptionally good, with creamy red fruit aromas, and quite soft acidity. The white wines of the appellation are often thought to be not quite in the same class as the sturdy, satisfying reds, but Marsannay Les Langeroies Blanc 2012 is balanced and fresh with a fine persistence of lemony fruit and a lingering minerality. 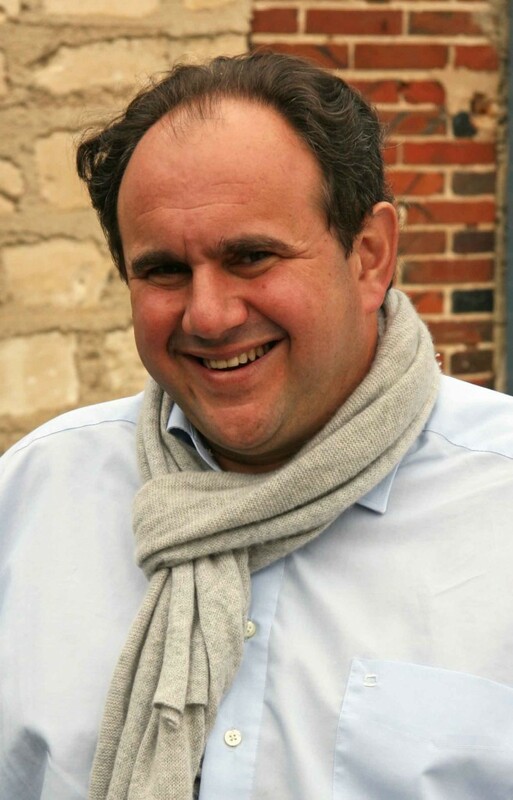 Sylvain Langoureau is based in the hamlet of Gamay with most of his vineyards in the appellation of Saint-Aubin. I first tasted his wines, most of which are white, over ten years ago and was impressed. I now find them more generous and a little less austere, but still with a fine linear quality to the fruit. Everything here is good, starting with a deliciously fresh 2011 Aligoté. Saint-Aubin 2011 was aged in 20% new oak with sparing use of lees-stirring. From mainly calcareous soils, it shows fresh lemony fruit and a degree of complexity. The 2010 is now more open and perfumed, but also richer and more concentrated, with a grapefruit quality to the fruit and a savoury, lingering minerality that characterises most of their white wines. Saint-Aubin Premier Cru, Sentier du Clos 2011 from a South, South-East facing site with a little more clay content is elegant, with a floral white peach quality and quitter soft acidity. Saint-Aubin Premier Cru, En Remilly 2011 is longer and more concentrated, with savoury hazelnut aromas, and more mid-palate richness. Jasper Morris considers this steep, stony, south-facing slope the finest of Saint-Aubin vineyards, “effectively the continuation of Le Montrachet”. Meursault-Blagny, Premier Cru, La Pièce sous le Bois, 2011 is also extremely fine, with complex, spicy lemon and white peach flavours, richness and minerality. A red Chassagne-Montrachet 2011, with a maceration only with pumping-over to ensure that the fruit is a supple as possible shows a fine purity of red fruit aromas, fresh acidity and yet again, minerality at the end. Sylvain and Nathalie Langoureau lost 53% of their crop in 2012 and will be forced, as is the general trend to raise their prices by 25%, but to their credit, Nathalie says that they hope to bring their prices back down if 2013 produces a normal-sized crop. They have experienced a little coulure during flowering, but the signs are otherwise good. I was introduced to the wines of Henri et Gilles Buisson by Christopher Fielden many years ago and have since visited their cellars, nestling up in the village of Saint-Romain, many times. Under the care of Frédérick Buisson and his brother Franck, the wines are better than ever. Although they have vines in a number of appellations of the Côtes de Beaune, just over half of their 19.5 hectares are in Saint-Romain itself, and are now certified as organic. 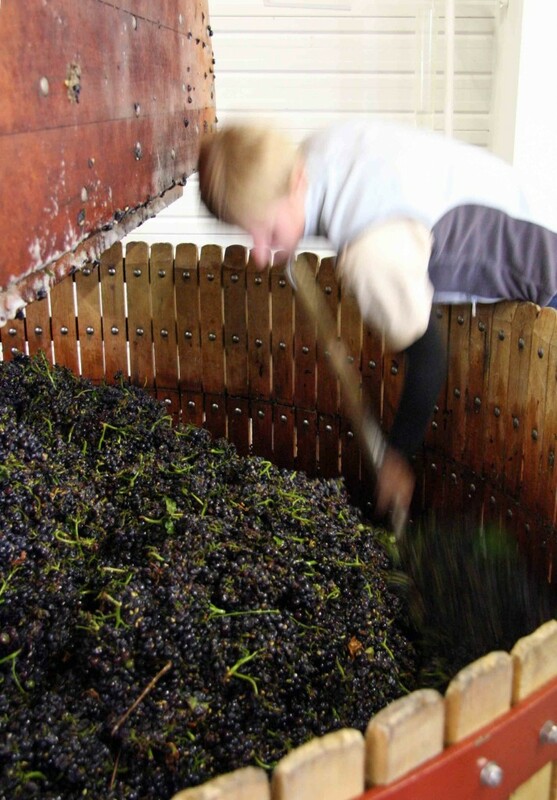 For their red wines, according to the conditions of the harvest they may include up to 50% of whole bunches and increasingly age their wine in demi-muids rather than traditional pièces bourgignonnes. They use10% to 30% new barrels, depending upon the cuvée. A simple, generic, red Bourgogne 2010 shows juicy, fresh, but creamy fruit. Saint-Romain Sous Roche, 2009 is much more interesting with delicious, ripe morello cherry aromas and crunchy, well-balanced fruit in the mouth. The same wine in 2010 shows spicier fruit, fine freshness, ripe but firm tannins and real depth. The 2008 is perfumed with cranberry aromas, quite crisp acidity and ripe fruit and tannins. Wines from other crus all clearly express the typicity of their terroirs. Auxey-Duresses Premier Cru, Les Ecussaux 2010 is bigger and more vinous, again reminiscent of morello cherries. It has a well-judged balance of ripe fruit and tannins. Pommard, Les Petits Noizons 2010 is big and earthy with almost a touch of iron. Very rich, it shows firm tannins which help to give it length. Volnay Premier Cru, Chanlin, 2011 is particularly perfumed and spicy, with a creamy texture, quite soft acidity and gentle tannins. Corton, Rognet et Corton 2008 is elegant with perfumed red fruit aromas and a well-defined, precisely-balanced structure and considerable length. Two white wines also show well: Auxey-Duresses, Les Ecussaux 2009 (village, not premier cru) which is ripe, rich, soft and nutty, but also quite mineral and St Romain, Sous la Velle 2011, which is floral, balanced and quite long, with lemony fruit. Domaine Ragot is another old favourite where the quality of the wine-making, always good, has nevertheless steadily improved. 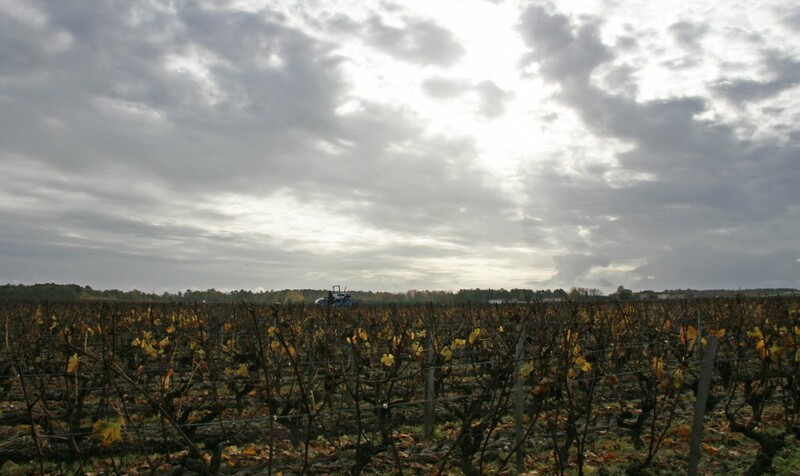 They own ten hectares of vines spread between twenty parcels in around Givry. Their main production parallels that of Givry as a whole, with an emphasis on Pinot Noir. The run of low yields mean that they reckon to have lost the equivalent of an entire year’s crop in the last three years. The wine-making is gentle, with 100% de-stemming, an emphasis on extraction by pumping over and maturation in a mix of large, old, wooden vats and/or barrels, according to the style of the wine. They do not wish to mask the fruit. In 2011, they also admit to having performed a small, if judicious chaptalisation – to raise the abv not more than 0.5%. Of their whites, the simple Givry Champ Pourot 2011 shows good, lively, if rather soft fruit and the Givry Premier Cru, Crausot, 2011, made in small quantities, just a thousand bottles per year from a lime-rich site, is very fine indeed, with complexity, mineral length, and rich buttery fruit balanced by fresh acidity. Red Givry 2011 is fresh and fruity, with distinct strawberry aromas. It has quite juicy acidity and slightly green tannins, but with food, any edginess melts away. Givry Vieilles Vignes 2011 (forty year-old vines) aged in 10% new oak barrels is much deeper-coloured, richer and fruitier, with black cherry, round, ripe tannins and a mineral finish. Givry Premier Cru, la Grande Berge 2011, aged in 20% new oak, a site with a little more clay, is elegant and fine and almost floral, with an emphasis on red fruits, backed by soft tannins. Givry Premier Cru, Clos Jus 2011, aged in 30% new oak from a site with shallow, iron-rich soil over limestone is the richest and most exotically-flavoured wine in the rage – very well balanced. I first met Pascal Pauget and his wife Sylvie on a cold December day in 2005 during a press trip. I was impressed with their wines then, an impression that has been re-enforced by each subsequent visit to Ozenay. For me, Pauget is the undisputed star of the northern Mâconnais. They have lost more than his fair share of crop in recent years and even in 2013 flowering has been less successful than in the Côte d’Or and Côte Chalonnaise, but I was even more disturbed to learn from Sylvie that the devastating disease Flavescence Dorée has been found in the commune of Chardonnay, where the Pauget’s own a couple of hectares of vineyards. Growers there are concerned not only by the strength of the insecticide treatments used to try and eliminate the vector, the leaf-hopper Scaphoideus titanus, but also by the lack of compensation if grubbing-up is necessary. Despite these considerable worries, the Pauget’s wines are as good as ever. Mâcon Blanc, Terroir de Tournus 2011, from a stony, calcareous soil, shows good fruit purity, crisp and citrus, ripe and balanced. Mâcon-Chardonnay 2009, from deep marl and clay, is ripe and lemony with a fine tension between richness and freshness. Their Mâcon Rosé 2012 is made from both Gamay and Pinot Noir – obtained by saignée from all the red cuvées. It is quite sturdy, with a mix of rhubarb cherry and spice aromas, plenty of crunchy fruit and a savoury finish. Of the reds, Mâcon, Terroir de Tournus 2010 (100% Gamay) is surprisingly big and spicy, with juicily sweet fruit underpinned by darker, liquorice-like flavours and soft tannins. Sylvie is right to regret that Gamay is rarely treated with such seriousness in the Mâconnais. Mâcon 2011 from Préty, Bugundy’s only vineyard East of the Saône, opposite Tournus, on pink limestone is a tremendous effort: a big, spicy wine, quite black and even a touch reductive (Sylvie recommends that it should be carafed), with layers of rich, softly-spiced fruit. Bourgogne rouge, Terroir de Tournus 2011 (Pinot Noir) is elegant and spicy, with balanced tannins, ripe fruit and touch of minerality. The second part of the Institute of Masters of Wine 2012 Champagne Trinity Scholarship enabled me to return to Champagne to the three family-owned houses of Pol Roger, Louis Roederer and Bollinger to taste the vins clairs – still wines from the 2012 harvest. I failed to dodged unseasonable snowstorms, gained an unwelcome, intimate knowledge of CDG’s terminal 2E during 48 hours of cancelled flights, and once again, experienced fabulous hospitality in Champagne. After an orientation session with Violaine de Caffarelli of the CIVC (the main trade body of the region, which represents both the growers and the powerful Champagne houses), whose notes form the background to my summary of the growing season, my first tasting of vins clairs was at Bollinger. At Louis Roederer Grégoire Fauconnet treated me to a quite remarkable selection of wines from parcels destined for Cristal. I then spent a fascinating morning at Pol Roger in the genial company of Hubert de Billy. The opportunity to taste the vins clairs from what seems likely to be regarded as a truly great vintage was a special privilege, but even more than this, I learned a great deal about the effects of different viticultural regimes and cellar practices on the quality and style of the wines. I shall focus on this later, but first, a little bit of background. 2012 was a nightmare of a growing season. The temperature from March to September was average. Rainfall was a little high – 67mm above average, but little else conformed to recent norms, except the sheer unpredictability of the weather from one month to the next. After bud-break, growers faced a damaging series of frosts. There were five damaging frosts in late April and early May, the last on 10 May. The temperature fell to -7.7C.131 communes were affected, 13,500 ha. of vines suffered, and the crop from 2,900 ha. was wiped out. The Aube was hit worst. Further damage was caused by a succession of violent early summer storms. Flowering began on 16 June and was poor, leading to both millerandage and coulure. A long period of changeable warm, wet weather meant that mildew was rife and oïdium followed. Organic and biodynamic growers found that as soon as had they sprayed their vines with copper it was immediately washed off again. Roederer’s team, for example, had to spray their Marne Valley vineyards with copper sixteen times. But then July turned more settled and the very warm weather continued through August, with temperatures that peaked over 34C. The grapes ripened but shrivelled. The small crop that remained was healthy and even benefitted from mid September rains at harvest time, which swelled the grapes by up to 15%. Although phenolic ripeness of some Chardonnays sometimes lagged behind the development of flavours in the grapes, the quality of the crop was greeted by immediate and almost universal acclaim. Harvest for Pinot Noir began on 14 September, Meunier on 16 September and Chardonnay two days later. The average yield was, of course, down at 9,200 kg/ha, a loss of around 40%. The CIVC estimates that 10% of losses was down to hail or frost, 10% down to disease, especially mildew and oïdium and 20% was down to flowering problems. Prices rose again. Depending on the courtier, a kilo of grapes fetched between €5.2 and €6.1. The raw figures suggest that growers’ initial optimism was founded on much more than a feeling of sheer relief at having any kind of healthy crop to harvest. The average potential alcohol for all three main varieties was 10.5% abv. Few winemakers were tempted or needed to chaptalise their musts. Acid levels were very respectable: Pinot Noir was 7.9g/l (H2SO4, according to CIVC’s figures – this way of expressing total or titratable acidity gives lower figure than the more usual UK measure of g/l measured as tartaric acid), Meunier, unusually, was a little higher at 8.2 g/l and Chardonnay averaged 7.7 g/l. It was immediately clear from the very first batch of vins clairs that I tasted at the CIVC from grapes grown at their Plumecoq research vineyard that Pinot Noir is the glory of 2012. The Chardonnays can be impressive too, but some seem a little clumsy in comparison with the racy elegance, complex aromas and magnificent balance of the best Pinot Noirs. From a snatched conversation with the influential Champagne expert Michael Edwards during the tasting of vins clairs at Bollinger I learned that some growers in the Côte de Blancs are disappointed by the relative lack of finesse of their Chardonnay. In contrast, the few examples of Meunier I tasted were very good indeed, and benefitted from the slightly raised acidity in comparison with Pinot Noir. Louis Roederer farm around 22% of their own vineyards either organically or biodynamically. I had the rare opportunity to compare a number of wines from the same cru, from fruit grown using conventional viticulture and from that grown biodynamically. The results were sometimes startling. For example, biodynamic Pinot Noir from Avize revealed an extra dimension of complexity with acids that were both stronger, but also riper and more creamy. This, said Grégoire Fauconnet, is a typical profile of biodynamically-grown grapes from Roederer estates. In general, the biodynamic wines simply expressed more personality, specifically with better defined fruit characters and more ‘tension’. The soil of the Cristal parcels is predominantly calcareous, and the vines, exclusively Pinot Noir and Chardonnay, are at least twenty five years old. They form a wide selection from the best sites in Roederer’s own portfolio. Grégoire told me that experiments with biodynamic viticulture on less favoured sites does not reveal the same level of improvement. The evidence from Roederer estates is that biodynamic viticulture leads to better balanced, healthier plants, which are better able to produce fruit that optimises the potential and typicity of each site. If this is indeed so, it follows that the most striking results will always be achieved on the best sites, simply because they really do have the potential to produce the best fruit. The most immediate differences between wines vinified and age in tank and those in casks was evident at Bollinger. Bollinger have a policy of using a mix of small barrels, bought second-hand from Burgundy producers, most recently from Chanson Père et Fils. The collection includes some casks made in Champagne over a century ago. None are younger than fifth fill. The cask samples were uniformly less fruity and more oxidative. Curiously, despite the age of the barrels, some showed marked toasty notes. More significantly, perhaps, the oxidative style of maturation seemed to beef up the structure of the wines with more evident acidity, differences shown clearly, for example, in two wines from Aÿ. The tank wine showed more vivid red fruit aromas, the cask wine, though less fruity, was richer and more powerful. But I soon learned that the reason for of some of these differences was not entirely be due to the method of maturation. The penny dropped when I noticed that a cask sample from Verzenay was deeper coloured than tank sample. This is the inverse to what I might normally have expected because the more intense lees contact in a barrel should absorb colour. The explanation is that Bollinger tend to put their better quality, more powerful wines in barrel and the lighter in tank. At Roederer there are no small barrels. The fruit destined for Vintage wines and for Cristal is also vinified in a separate winery for that used for Brut Premier NV. This enables the Roederer team to adopt a different, less interventionist strategy, with, for example, no attempt to impose a malolactic fermentation on the wine. Their aim is to work with ripe fruit with naturally lower levels of malic acidity. Some wine from the Cristal plots goes into stainless steel, other batches into 100 hl casks. Not surprisingly, the wine aged in the large casks, does not readily display the oxidative style obtained by Bollinger’s small barrels, indeed one of the more reductive samples I tasted was from a wine from Vertus (Montferré), aged in casks, which also had a lemony, leesy richness. A naturally rich vintage like 2012 receives less lees stirring than that from a lighter year and may be therefore more open to reduction, not least because with little or no malolactic fermentation, sulphiting must be carried out earlier. That said, reductive notes were evident in very few of the vins clairs I tasted. A more significant difference between tank and cask matured wines was that, some of those from tanks tended to display more crunchy, malic acidity, which was masked by the slightly leesy character of the wine aged in oak. Pol Roger’s vins clairs have a distinct character. They combine a tight structure with a refined elegance. This is emphasised by a winemaking regime that begins with extended cold, or rather cool settling at around 17 to 18C, for up to fifteen days. The aim is to work with very clean juice and, says, Hubert de Billy, to produce wines with freshness and finesse. He cites as evidence the ‘rare finesse’ of the wines they made in the challenging circumstances of the 2003 heat-wave. The wines undergo a full malolactic conversion, which also enables Pol Roger to sulphite as little as possible. Indeed, “we are the house that sulphites least,” claims Hubert de Billy. In the past they have not, however, been afraid of chaptalising their musts (adding sugar at the time of fermentation to raise the alcohol strength). All the wines are vinified and aged in stainless steel. Pol Roger’s house style seems to have served them well in producing 2012 Chardonnays of unusual precision and, indeed, finesse. One wine from le Mesnil was exceptionally fine with its piercing, ripe acidity. But the three examples of Meunier I tasted were also unusually refined, with a splendid wine from the unsung slopes of Baulnes sur Brie that married the typical spicy red fruits of the variety with deliciously fresh, but ripe acidity. Hubert described in detail how the final blends at Pol Roger are agreed, all with the aim of maintaining that distinct house style, across the whole range that appeals to his customers. The same process is clearly evident at both Louis Roederer and Bollinger too. I feel privileged to have had the opportunity to taste some many great wines from a truly remarkable vintage in Champagne and I look forward to watching the evolution of those wines that are declared as ’vintage’. At Pol Roger this is likely to be as much as 30 to 35% of the total production. But it is the way in which viticulture and winemaking are both used to craft something distinctive from each site, creating a typicity that is not just a matter of terroir but of house style, that has struck me most. And the skill of the winemakers and others in manipulating the rich palate of flavours available to create consistent blends is truly remarkable. At Louis Roederer, Grégoire Fauconnet also treated me to a fascinating tasting of cask samples of their reserve wines, blended from the Cristal parcels: from 2011 to 2000. The chance to taste these remarkable wines gave me a privileged insight into the character of the most successful vintages of the last twelve years. 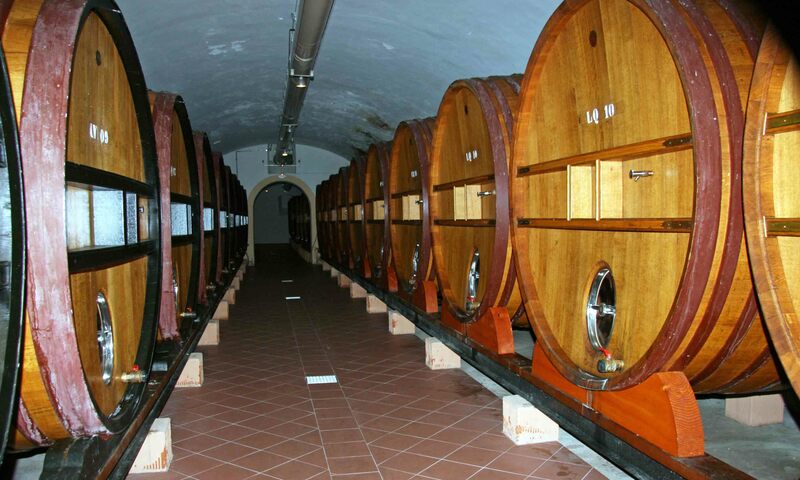 The wines are dominated by Pinot Noir and have been kept in large oak foudres. 2011 Rich, open nose. Lot of spicy structure – long. 2010 Shows much more oaky character, but very rich, powerful and spicy. Mineral finish. 2009 Much less oaky. Fresh nose, with hints of grapefruit, other citrus fruits and honey. Some buttery notes. Mineral finish. 2008 Vanilla and spice, but above all wonderful freshness and bags of potential. Superb balance. 2006 Fruit and oak well integrated. Rich and quite open. 2005 Again very rich and fine with well-integrated flavours, but superb supple acidity to balance the richness. 2004 The oak shows again. Very ripe, almost peachy, rich fruit leading to a fine, dry, mineral finish. 2002 Immensely complex, with an aroma of hazelnuts. Lively balance. Wonderful, lingering finish. 2000 Brioche notes for the first time. Seems young, with fresh, focused acidity. I had hoped to have a full report on my latest diggings in Valpolicella country available today, but … idiot that I am, I left my main notebook in a winery in Italy. It has been found and is on its way back to me. As soon as it arrives Amarone and all things Valpolicella will be in full swing here. Posted in Italy | Comments Off on Amarone Coming soon! The Wine Society offers a superb selection of wines, a great resource, I’ve found, for my wine educational activities. When I visited the society’s warehouses and offices in Stevenage recently I was especially pleased to taste some of the Society’s own label wines, including some of its ‘Exhibition’ range. Together, they are a vivid illustration of the keen wine buying skills of the Wine Society team. Typical lavender oil aromas, then soft, creamy acidity and just off dry (though I’m told the residual sugar is actually below 5 g/l). Excellent value fizz: nicely rounded and gentle. Even better value, this clean, creamy, fresh-tasting fizz, doesn’t show a great deal of yeasty autolysis, but is beautifully balanced. A blend of Chardonnay, Chenin and Pinot Noir. Fresh, green, grassy aromas, then clean herby fruit, fresh, savoury/mineral and lingering. Quite scented, green apple aromas, then slightly mineral. A creamy, leesy palate that balances rich, soft, green apple flavours and a mineral finish. Outstanding value. Ripe melony aromas, then a palate that balances more ripe fruit, with fresh acidity and ends with a perfumed lift. Far more complex and interesting than most Italian Pinot Grigio. Typical grassy, gooseberry, blackcurrant leaf aromas. Ripe but crisp and a mineral finish – all it should be. Fresh, mineral and apple aromas and a round, creamy, savoury palate. Hints of pineapple, but the accent is firmly on restraint and elegance, despite the high alcohol. Real complexity and finesse here, justifying its price tag. A creamy, nutty aroma, then ripe melony fruit, with subtle use of oak. Very fresh, lemony aromas, with honey. Savoury, clean and fresh in the mouth, with softer acidity than I expected, and gentle sweetness. Lovely wine. The Society have splashed out on a wine that fully justifies the ‘exhibition’ tag: big and ripe, but balanced by freshness, and underpinned by soft, ripe, very spicy fruit, with a particularly seductive middle palate and a dry finish. Lighter and juicer than some, it has grassy, plummy, even raspberry aromas, vey juicy acidity and quite firm tannins. Organic too. Cunningly blended from three different growers, this is a real success, with lovely spicy, fresh, savoury, cherry fruit – and surprising depth. The colour is already maturing, leading into a rich, typically oaky aroma, and quite chunky, spicy plum and cherry fruit. Utterly typical bitter cherry fruit dominates. Clean, quite soft and easy. Well-made claret, with the vivid aromas, typical of the vintage, and a fresh, spicy palate. With supple tannins it’s fully ready. Big and brambly with lots of spice, but balanced by quite fresh acidity. Plenty of ripe bramble and black cherry fruit a chewy texture and a spicy finish. As it should be in this ripe vintage. Real concentration of ripe, plummy Christmas cake fruit and yet again, balanced by juicy acidity and nicely integrated oak. Still marked by scented oak, but also by plenty of ripe, sweet, apricot fruit, with the elegance of Barsac. A real treat to finish with and a bargain to boot: a huge nose of intense, figgy, raisiny fruit and walnut, then an equally concentrated mouthful of the same. Sweet, but not excessively so. On 21 November, as heavy rain gradually gave way to bright blue skies, we were met by Suduiraut’s technical director, Pierre Montégut. Suduiraut, a Premier Cru of Sauternes in the 1855 classification is in the commune of Preignac just below the vineyards of Château Yquem. It was bought by AXA Millésimes in 1992. The soil of Preignac is typically gravelly, with quite large pebbles. This, says Pierre, is a major factor in the style of wine from the commune, which is less rich and unctuous than in the more clay-rich soils of neighbouring Sauternes and with something of a hint of the green freshness of Barsac, where there is more limestone. Suduiraut’s 92 hectares of vineyards are mostly on gravel around the château, but there are also two blocks on richer soil near Yquem. According to seasonal conditions, Suduiraut’s style can switch. It was more Sauternes-like in 2003, 05 and 09, but fresher in 2002, 07 and 11. The blend in the vineyard is 90% Sémillon and 10% Sauvignon. There is no Muscadelle, which is better on clay. The main rootstock is 420A which is well adapted to soils with a high level of active calcium and is therefore ideal for Barsac, as is Fercal. 3309 is good for dry sites and 101-13 for fresher soils. The vines are trained on wires, but with up to four spurs on each plant. Pierre aims for 6 to 8 bunches on each vine and for small berries, which tend to produce more pure aromas and better flavours. The minimum potential sugar allowed by the rules of the appellation is 15%. Pierre likes to have at least 20%. Over the past fifty years sugar levels have risen significantly. In the 1960s, a good level of potential sugar was deemed to be around 19 or 20%. In 2005 it was over 30%. The residual sugar in the great 1967 vintage was 90g/l, in 2005, 09, 10 and 11 it was consistently around 140-160g/l. There is now often more focus in very years like 2005 and 09 on keeping fresh acidity in the wine than in achieving roundness and sweetness, but botrytis always remains an essential element in the style of Suduiraut. The grapes, he observes, are also riper now at the onset of botrytis. The picking team of 120-150 souls typically make three to five passes (tries) in the vineyard. The greatest number of tries was eight in 1988, but so many passes makes for a very expensive harvest. There is no sorting done separately in the winery. Quality depends on the pickers. Vineyard practice at Suduiraut is on the cusp of organic and 25 hectares are managed fully organically, which in a difficult year like 2012 meant a significant crop loss of around 50%. Bearing in mind studies that have suggested that copper can diminish grape aromas, careful checks have been made on the level of copper in both dry and sweet wines at Suduiraut. Greater levels have been found consistently on those harvested earlier, without botrytis, for dry wines. 2012 has been difficult because although there was a good level of botrytis at the start of October, the sugars were diluted by rain and harvest had to begin before the botrytised turned to grey rot. The yield for the sweet wine was just 8 hl/ha. Once in the winery the whole punches are loaded directly into a pneumatic press. The first pressing at 2 bars pressure releases 80 to 88% of the juice. The pommace is then loaded into a basket press which operates up to 9 bars and releases juice which is very sweet, very perfumed, with higher pH and glycerol, but a little les finesse. A pH of 4 or more is common with botrytised grapes, but 3.8 is the ideal if the wine is to age well. The wine is then fermented in small oak casks, 50 to 60% of which are new for Château Suduiraut and less for the other two Sauternes made here: Castelnau and Lions. Light to medium toasts are the preferred choice. Yeast nutrients are often added to help finish the fermentation quickly. Pierre feels that a ten to twenty day fermentation is essential to maintain the purity of the fruit and to restrict the development of volatile acids. Fermentation is then fully stopped, first by cooling the juice to kill the yeasts and then by the addition of sulphur dioxide – the higher the level of botrytis, the higher the level of sulphur. The aim at bottling is to have 50mg/l of free SO2. The sweet wine is usually racked after the mutage of sulphur dioxide. (Mutage is this instance does NOT mean adding alcohol as at least one other blogger seems to think!) Because the estate’s dry wine undergoes lees stirring in cask, it is not racked. After aging in cask for 18 to 24 months the Sauternes is fined with bentonite and sometimes also filtered before bottling. The other cuvées, Castelnau and Lions are aged for 12 to 15 months. Pierre readily admits that making a profit in Sauternes and Barsac is difficult. The average yield for the first growths he estimates at 9 to 15 hl/ha and 15-25 hl/ha for the seconds. To make money at Suduiraut he must achieve a yield of 15 hl/ha, but on four occasions over the last nine years this not been possible. Production costs are high, including dry goods (bottle, cork, capsule and label), Pierre suggests the price of making Sauternes can vary from €9 to €26 depending on the vintage and the level of selection exercised in the vineyard and winery. A major factor in achieving profitability is a successful en primeur campaign: 50% of Château Suduiraut is sold in this way and 25% of the other cuvees. Traditional sales on the French domestic market peak in the run up to Christmas, reinforced by the conviction that Sauternes is the perfect accompaniment to foie gras. But Pierre is anxious to challenge some of the attitudes that pigeon hole Sauternes in an inappropriate way. “We need to show that Sauternes is not just sweet, but is wine with great complexity,” he argues. “We’re trying to combat ideas such as you can’t drink other wines after Sauternes; that you won’t get a headache if you drink it; that you don’t have to cellar it for twenty years: ideas that mean, don’t bother to open the bottle. It goes so well with cheese, especially blue cheese. Forget puddings with Sauternes it’s often not a good idea.” And as we discovered later that evening, with a selection of older vintages, it can be a fantastic partner for Sichuanese cuisine (my notes lack coherence – the evening at Bordeaux’s Au Bonheur du Palais was rather splendid. Pierre believes that one of the best ways to get over the fusty old attitudes that dog Sauternes is to persuade more restaurants to offer it by the glass. Perhaps then those drinkers in France who consume just one glass of Sauternes a year (the national average, Pierre says), might be tempted to drink a second. Mind you, as half of Suduiraut’s sales are in France, that might not be such good news for the rest of us. The cuvée was first created in 2009 as a fresher, slightly lighter, more aperitif-style of Sauternes. The selection for both Lions and Castlenau is more often than not starts in the vineyard with specific parcels. The wine is very fresh, with citrus and peach aroma and a clean, rich flavour (130g/l sugar) with a nice little twist of bitterness at the end. Deeper colour, more obvious new oak and also botrytis with rich orange and apricot tones. Very powerful and complex with mouth-filling pineapple-like fruit and fine, balancing freshness (150 g/l sugar). Much more evolved than the 10, and rather more peachy fruit. Quite a lot of botrytis and fatness, but just a little short. Really quite closed, but ripe pineapple aromas emerging. A lot of botrytis, with quite a bitter finish. Fine old gold colour. The aromas is still wonderfully fresh – like ripe apricot with pain d’épices and real intensity. Drying just a little and very botrytised, but balanced by elegant acidity with a long honey, peach and apricot finish. I visited Pichon-Longueville on 20 November as part of a generous study scholarship awarded to Master of Wine students by AXA Millésimes. We toured the vineyards and winery with technical director, Jean-René Matignon who also conducted a vertical tasting, blind, of thirteen vintages from 1998 to 2010 before treating us to older vintages over dinner. Château Pichon-Longueville was awarded second growth status in the 1855 classification of the Médoc. 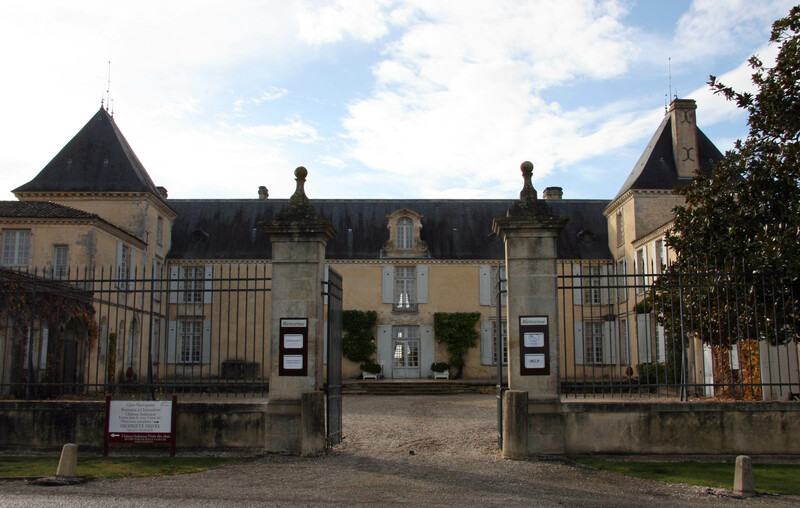 It is superbly situated in Pauillac overlooking Saint Julien to the south, and neighbours Châteaux Pichon-Lalande (from which it split in 1840) and Latour. It has enjoyed a somewhat chequered history during the last hundred years. From 1935 until his death in 1962 Jean Bouteiller made many great wines. Jean-René talks with relish about any opportunity to re-cork them and considers the 1937 as perhaps the best old wine in the château’s (rather small) ‘library’ collection. By the early 1980s, although some good wines were certainly made, the Bouteiller family had long since failed to maintain the high standards of the 1940s and 50s, to the point at which from 1982 to 1987 the grapes were harvested by machine: not a practice consonant with the level of rigorous selection needed to made great claret. 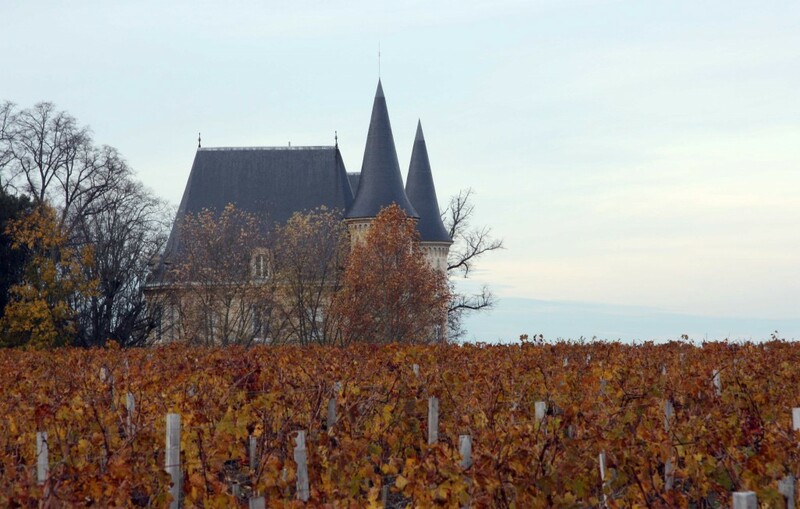 In 1987 the property was sold to AXA Millésimes who have since invested significantly in the vineyard and cellars as well as lovingly restoring the fine château itself, built in 1851. The popular name for the property, Pichon-Baron, still persists. The vineyard is 75 hectares large and the average age of the vines is between forty and fifty years. The main balance of the vineyard is divided between Cabernet Sauvignon (65%) and Merlot (32%) planted on the distinctively Médocaine Guyot Poussard system with two short replacement canes and a two-bud spur below to supply the canes for the following year. This is well-adapted to Cabernet Sauvignon and helps restrict disease, especially eutypa dieback. There is also a small amount of both Petit Verdot and Cabernet Franc. Cabernet Franc struggles with water stress here. Jean-René points out that it really needs soils with higher clay content, but some of the clonal stock in Bordeaux is poor and has been improved in recent years by clones from the Loire Valley. Petit Verdot is also sensitive to water stress. Gravels here are up to 2m deep. The younger gravels nearer the river are considered to be the better soils because they have more clay content, those further inland are finer, poorer and sandier. In times past it was traditional to add clay: to ‘marner’ the soil and improve it. Around 2% of the vineyard is replanted annually. In the oldest blocks, about 4% of the vines die anyway each year. Research has been carried out to identify clones resistant to fan leaf virus. The preferred rootstock is 101-14, with 3309 used where there is most risk of water stress and 420A on the limestone- rich soils planted with Merlot at Château Pibran in the northern sector of the appellation adjacent to Pontet-Canet. Riparia was tried in the past but it failed to ripen the fruit adequately. The most significant new disease risk is provided by Flavesence Dorée, which spreads very quickly and is difficult to control. The effect is green wood and loss of the crop. The vectors, a form of leaf-hopper, can be eliminated by spraying with organophosphates or organic pyrethroids, but Jean-René is worried that the latter present a health risk for his vineyard workers. It is also now necessary when old vines are grubbed up to treat the soil with insecticides and then to wait three to five years before replanting, a costly delay. 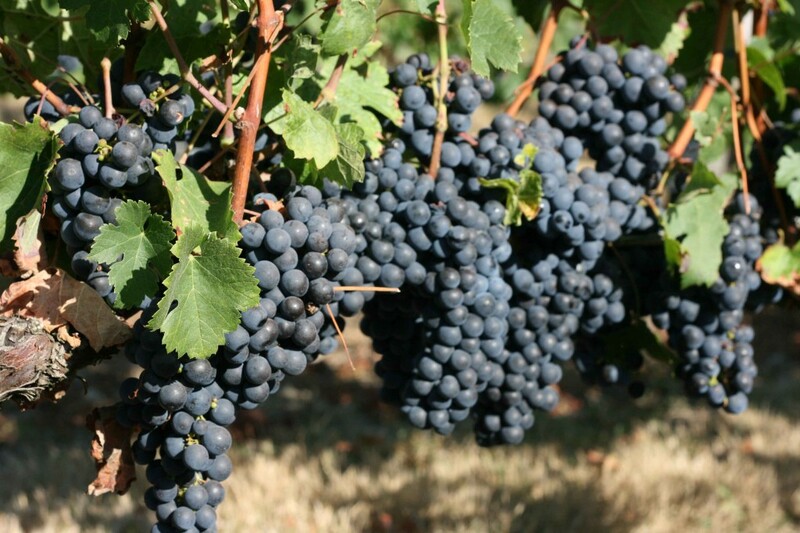 Cabernet Sauvignon can suffer from magnesium deficiency, which leads to dry, brittle stems. Magnesium may then be added every two or three years in spring along with compost at a rate of 100kg per hectare. Jean-René has practised integrate pest management since 2000. He is experimenting with organic viticulture on 5 hectares at Château Pibran, but is reluctant to extend the experiment to Pichon-Baron. One major objection is the high level of copper in the soil, which also limits the life of bacteria in the soil. Organic compost is, however, used generously: around ten to fifteen tonnes per hectare, per year, at a cost of €70 per tonne. It improves the texture of the soil and enables it to retain water better. Where crops are planted between the rows (rye grass and vetch) it can help to limit the migration of chemicals and help to effect their degeneration more quickly. Over the years labour costs have risen in the vineyard as more labour intensive strategies have been adopted such as leaf plucking on first one and then, sometimes, the other side of each row. Jean-René estimates that twenty years ago one vineyard worker could look after 2.5 hectares. This has now reduced to just 1.8 hectares. A fine new winery was built between 1990 and 1992, designed by the Panamanian-born architect Patrick Dillon, around 50% of which is underground. It is equipped with a new optical sorting machine (which cost €120,000). It has a capacity of 8 tonnes per hour and has made a huge difference to the quality of the wine: “Anthocyanins,” says Jean-René, “are the key to understanding the quality of tannin.” Prior to processing in the optical sorter whole bunches are sorted by hand and then the berries de-stemmed. 10 kg of berries at the desired colour profile are ‘shown’ to the machine to prime it. The high-quality of the optical sorter is such that Jean-René does not feel it necessary to use a top of the range, expensive de-stemmer, which he argues would also be more difficult to clean. The cellar also boasts a reverse-osmosis machine, but this may only be used on must and not on finished wine. It can be helpful if the grapes arrive wet, or as for example in 2011, when the percentage of sugar in the Cabernet Sauvignon was a little low. After fermentation, pressing is done mostly in pneumatic presses on a gentle, ‘crémant’ setting. A new basket press is also available, but Jean-René has not yet noticed that it offers any significant advantage. Selected, cultivated yeasts are used: RB2 for Merlot to emphasise its freshness and fruit, Actiflor 33 for Cabernet Sauvignon, especially to reduce the level of volatile acidity. F15 is also used for both Merlot and Cabernet, though not as often as it was in the past. Délestage (rack and return) is used daily for the first three days of fermentation, then regular, daily pumping over for the next twenty five days. Jean-René is also experimenting with a pre-fermentation cold maceration at 5C. The grand vin is aged in 80% new oak and the second wine, Les Tourelles, in 30% new oak. Pichon Longueville 1998 to 2010 and a few older wines. It was an extraordinarily helpful exercise to be invited to taste the wines ‘blind’. It enabled us to evaluate the quality of each vintage without the baggage of expectations. The order in which they were served was 1998, 2000, 2002, 2004, 2006, 2008, 2010, 1999, 2001, 2003, 2005 2007 and 2009, but for ease as well as convention, my notes here are in reverse chronological order, along with notes on the 1990, 1988, 1986 and 1959 vintages, drunk later over dinner at the château. 2010 Very deep. Exciting, powerful, rich, sweet and spicy nose, with fantastic fruit in the mouth and a very silky texture – long, rich and ripe, with melting tannins. A remarkable wine. 2009 Also very deep. Sweetly ripe nose. In the mouth big and sweet, showing quite a lot of oak at the moment and quite high acid. Lots of structure. 2008 Deep and young. Quite a lot of new oak, but perfumed – fragrant and cedary. Sweet, perfumed fruit in the mouth, with fresh acidity and firm tannins. Good length. Elegant. 2007 Deep and quite young, but first signs of aging. Fabulous, opulent nose, rich and ripe – chocolate and cassis. Big and balanced with lots of power and length. A big surprise, but then I Iooked back at my note from the IMW claret tasting (see below 12 November 2011). I liked it then too. 2006 Still deep and young. A big wine, but a bit closed. Firm black fruit, firm tannins and quite juicy acid. A bit short and angular. 2005 Hard to assess: the first bottle seemed raw, un-knit and tannic, with high acid; a second was very much better, with a rich, ripe, creamy nose, then a dense, rich palate, still with a lot of perfumed oak and considerable elegance. 2004 Some aging apparent. Lovely perfume – complex, gentle and elegant. Sweet, balanced plate, elegant and long but already maturing. 2003 Quite deep, but also garnet-hued. A very appealing aroma of sweet perfumed fruit, but the palate is much chunkier than the nose suggests: sweet, chocolaty fruit, big, firm tannins and rather short. 2002 Deepish, but garnet edge. Big, spicy, chocolate nose. Big in the mouth too, with a lot of dry extract and a fine tannic structure. A little short. 2001 Still quite deep and not a lot of aging. Rich, ripe chocolaty nose with spice. Soft, sweet, full, still chewy and very long. 2000 Deep and young-looking, right to the rim. Sweet, pure fruit and quite spicy and complex. Fully mature, but sweetly ripe cassis fruit, with ripe tannins and good acidity. 1999 Aging, a marked garnet rim. Very evolved and mature, with sweet/balsamic notes and quite high volatile acidity. Sweet fruit in the mouth, but a hard middle and tough tannins. Short. 1998 Aging – a garnet rim. Open, spicy, rather Bretty nose. Sweet, but rather hard tannins and a bit short. 1990 Very good deep colour; slightly stalky and savoury with a green edge, but lovely length. 1988 Still big rich and complex, with wonderful fruit: cranberry and cassis. Very ripe, long and fine. 1986 Still deep and youthful, with lively, spicy complex fruit. Balanced, savoury and mineral on the finish. 1959 Clearly older. Quite a rich, balsamic nose, but beautifully scented. Still very rich in the mouth and surprisingly fresh, though with rather lifted acidity. Truffles. Mature – but what a treat! The harvesters at Louis Roederer’s base in Ay were celebrating the completion of their work and the prospect of not having to take a shower in the icy downpours that hit the region today. The pickers based at Verzenay were somewhat less fortunate: their job was not quite done. Roederer’s technical team, headed by Cellar Master and Assistant Director of Champagne Louis Roederer, Jean-Baptiste Lécaillon were in good heart, having come through as challenging a growing season as anyone could remember, and kindly answered my questions with a great deal of patient good humour. Jean-Baptiste, who has an extraordinary ability to reel off sugar-level statistics for vintages back to 1947, is very happy indeed with the 2012 harvest. He believes that it may turn out to be better even than 1996 and 2002. Sugar levels this year averaged 11.7, but some Pinot Noir at Cumières reached 12.8. Acidity is very fresh. Above all the grapes taste wonderful – the surest measure of quality. Yields are modest, averaging around 7,500kg/ha for conventionally farmed vineyards and 6,500kg/ha for those in an organic or biodynamic regime – not that Roederer are looking for volume: Jean-Baptiste prefers the greater concentration of fruit flavour that only comes from lower yields. There were 15 treatments this year on biodynamic and organic plots at the Domaine de Champagne, with a total of 4kg/ha of Copper used (still comfortably below the biodynamic limit of 5kg). Last year there were 7 treatments and a total of 1.6kg of Copper. Unlike some less experienced organic growers, Roederer’s vines yielded an acceptably-sized crop. Roederer are unusual amongst the great houses of Champagne in having a considerable commitment to organic and biodynamic viticulture, around 22% of their holdings: 40 ha in biodynamic and 15 in organic. The purpose of organic and biodynamic viticulture at Roederer is to improve fruit quality, but also to enable those who work the land to re-establish a closer link with it and thus a better understanding of it. ‘Know-how’ is one of Jean-Baptiste’s watchwords. By the same measure, the 15 ha hectares of vineyards that are worked by horse are not primarily to lessen soil compaction but ‘to rediscover how to do it and in the process learn much more about their site – where the soil is hard and where it’s soft, and so on. Even the horse will get to know it too!’ Jean-Baptiste wishes that all his tractor drivers could take at least a short course in ploughing by horse. More detailed research on the effects of organic and biodynamic viticulture is planned and negotiations are taking place with possible university partners. Jean-Baptiste and his team are clearly not rigid followers of Steineresque philosophy but believe that the upshot of research will be a new middle way between organic and biodynamic regimes in which the best of both are combined, using as much supporting empirical evidence as possible. So far the opinion of the team is that the organic and biodynamic plots produce better fruit, with both higher sugar and acidity. Jean-Baptiste suggests that a more open canopy brings better-aeration and that the vines absorb less Potassium. The biggest differences are between conventional viticulture and organic and biodynamic together. Biodynamics adds little empirical value to the benefits of organic viticulture, but it is an important tool in achieving a new kind of precision viticulture (conventional research in precision viticulture is also part of the programme). Other important research has been on massal selection from plots of the best old Pinot Noir vines to develop strains that ripen later and are more resistant to leaf-roll and fan-leaf viruses. Massal selection techniques are also being used to develop new, less vigorous clones of rootstock 41B. Jean-Baptiste points out that most planting material comes from stock raised in warmer climates, especially Spain, but at Roederer they have the chance to breed from stock that is adapted to the calcareous soil and cool conditions of Champagne. Important work is also being carried out on local yeast strains. Another project is investigating canopy management. Experiments with Lyre training have not yielded encouraging results and so far, Jean-Baptiste feels that although high and wide does offer higher acid/lower pH for the same sugar levels as traditional cultivation, it also produces fruit with a greater tendency to reduction. For the foreseeable future Jean-Baptiste believes that traditional training methods will continue to meet Champagne’s needs best. I learned a great deal in a short time, but was struck by how flexible the thinking Jean-Baptiste’s approach is, having first establish a commitment to continue to produce Champagne that is ‘al dente’, with fruit, freshness and even the expression of terror, otherwise a precious concept at Roederer, all in balance. Winemaking is typically reductive, but Jean-Baptiste is unafraid to allow pre-fermentation, hyper-oxidation of second pressing (taille) juice if is will ultimately render it more stable and whilst he goes to pains to work with fruit that is naturally unlikely to undergo a malo-lactic fermentation, it is no disaster if it happens. It is an approach that, to me, makes a great deal of sense. These four days of visits were made possible by the very generous Champagne Trinity Bursary of the Institute of Masters of Wine. I look forward to my second visit in a few months’ time and would like, in particular, to thank Sylviane Lemaire of Pol Roger and her colleague in the UK Elizabeth Vaughan for making all the arrangements for my stay in Epernay; Mathieu Kauffmann and Christian Dennis at Bollinger, Hubert de Billy and Matthieu Blanc at Pol Roger; Violaine de Caffarelli, Laurent Panigai and Philippe Wilbrotte at the CIVC and Martine Lorson, Jean-Baptiste Lécaillon and his team at Champagne Louis Roederer. You are currently browsing the Helen’s blog blog archives.